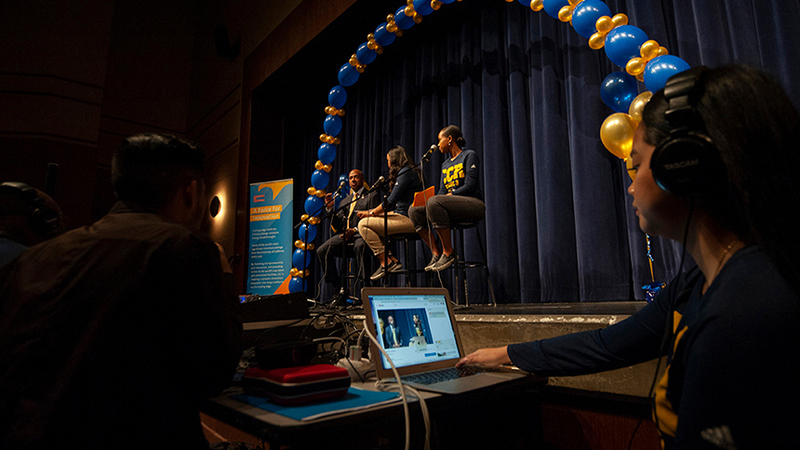 Chancellor Gary S. May answers questions during a podcast that was part of Achieve UC at Inderkum High School last week. 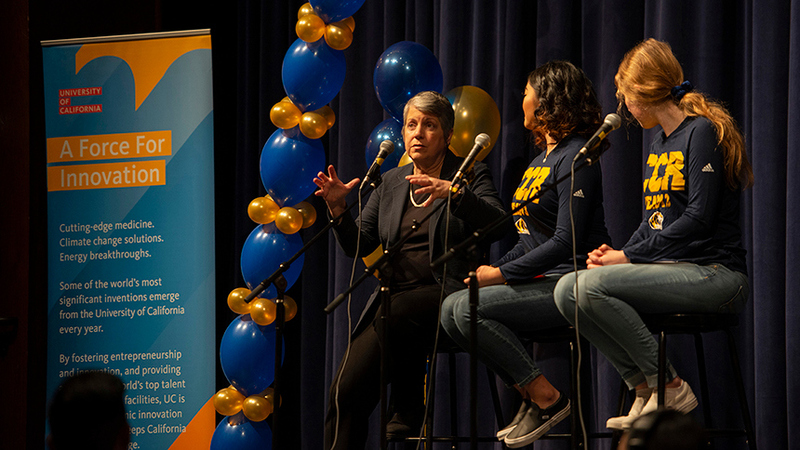 UC President Janet Napolitano and Chancellor Gary S. May encouraged students at a Sacramento event last Friday (March 1) to pursue a college education, and a podcast is helping to further share their message. Student hosts of the College and Career Readiness Podcast interviewed Napolitano and May as part of Achieve UC at Inderkum High School. Livestreaming before an audience of about 150 classmates, the hosts asked questions on a wide range of topics including personal career paths, women in leadership, the nature of a UC education, diversity and even UC leadership on climate change. The podcast also included an interview with Ebony Lewis, executive director of Undergraduate Admissions at UC Davis. The podcast was shared live in some Inderkum classrooms. A recording is available on YouTube, and later an edited version will be posted on the podcast's website for on-demand listening and viewing. 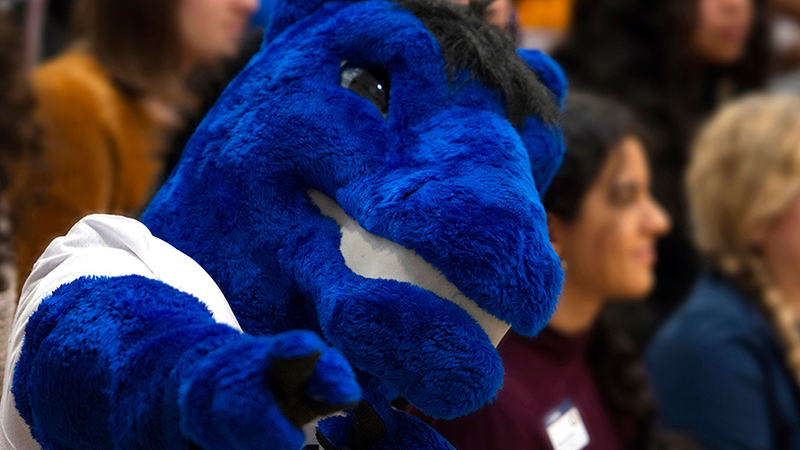 Earlier in the morning, Gunrock, UC Davis' mascot, helped build excitement at a rally for about 1,200 students in grades 10 and 11. "A college degree helps put your destiny in your hands," May told the students at the rally. He said UC Davis offers support to foster the success of students — including those who would be the first in their families to go to college. New Latthivongskorn, a 2008 graduate of the high school who has gone on to medical school at UC San Francisco, shared his advice: "One of my most important life lessons is you don't have to do it all alone." Napolitano let students know that financial aid is available if they need help paying for college. Students from the College and Career Readiness Leadership Team at the high school partnered with staff from the high school and the Early Academic Outreach Program (EAOP) at UC Davis to organize the day's events. 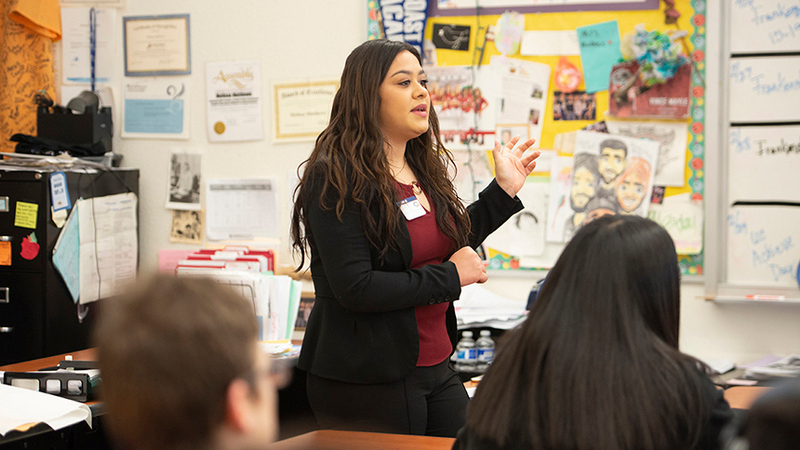 In one of the event's many classroom presentations, Yuliette Olivas-Gonzalez, a student outreach assistant with the Early Academic Outreach Program (EAOP) at UC Davis, shares information about financial aid. The day's activities also included classroom presentations on financial aid by EAOP representatives and a college fair where students could talk with representatives of UC campuses. "EAOP does an amazing job with our kids," said Dan Motherspaw, Inderkum High principal. 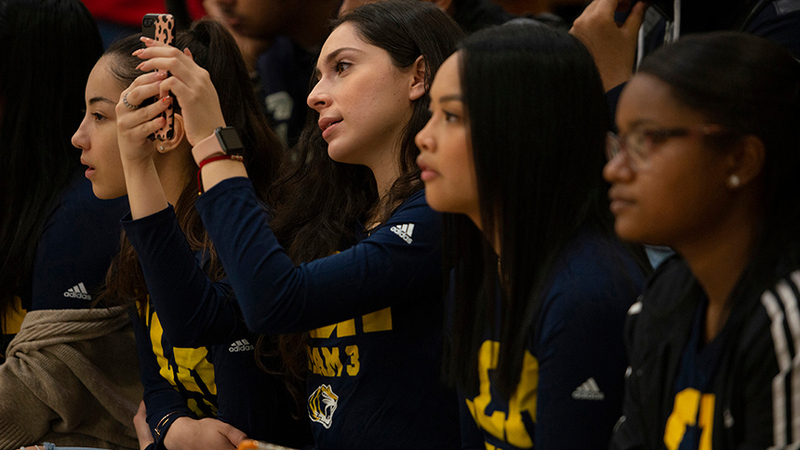 His school is one of more than 30 schools where the UC Davis program helps motivate and prepare students — some 2,800 participants in all — to pursue postsecondary opportunities..
"Today is really a full-circle event for me," Motherspaw added. A first-generation college student, Motherspaw was encouraged to pursue college by his parents and his high school biology teacher. He graduated from UC Davis with a degree in wildlife and fisheries biology in 1997. Susan Heredia, center, president of the Natomas Unified School District board of trustees, greets Ana Garcia, the EAOP staff member who was lead organizer for the Achieve UC event, as Inderkum High Principal Dan Motherspaw, right, and others look on. At a meeting before the rally, the event that reunited Motherspaw with Gunrock also brought two others back together: Ana Garcia, the regional assistant director for EAOP at UC Davis and lead organizer for the Achieve UC event, and Susan Heredia, president of the Natomas Unified School District board of trustees and a professor at California State University, Sacramento, when Garcia was pursuing a master's degree there. 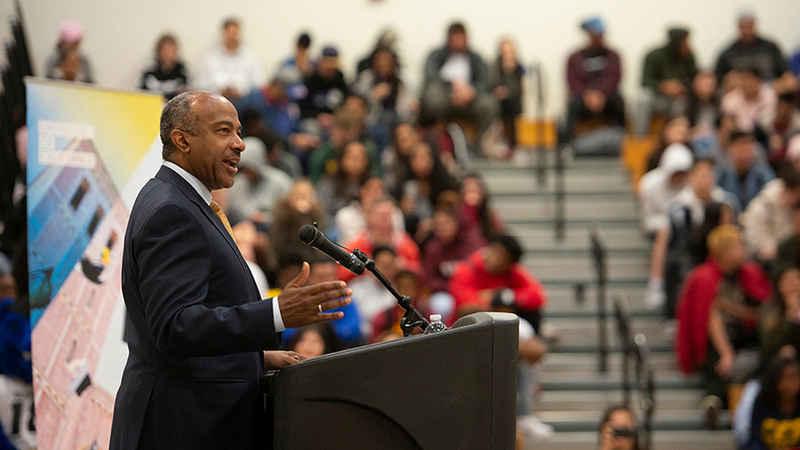 Read the chancellor’s reflections on his visit to Zamora Elementary School earlier last week, in "CHANCELL-ING: A Pep Rally That Drops Knowledge About College."